It’s just a coincidence you say? 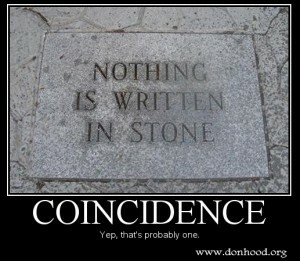 Many people do say it’s just a coincidence when something happens that is fortunate in their lives. 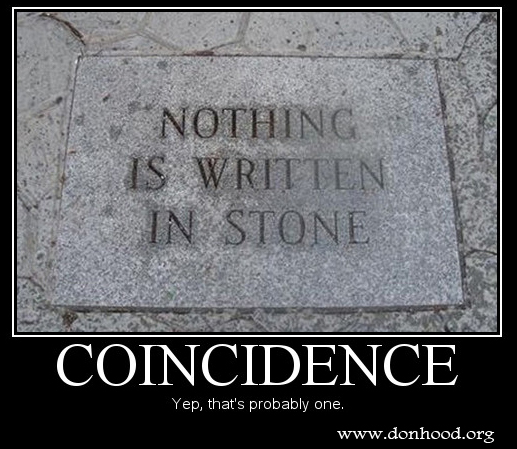 Why is it that we see these things as happenstance when certain things come into our lives? Also, why is it when we are looking into the future we think, that it will probably turn out for the worst? Who do you think you are to be deserving of some good thing to happen in your life? Or, are you just bracing yourself for the “reality” of it not going the way you would like it to go if you were “good enough?” “I’m not good enough.” This has been our programming for ages. We are constantly programmed by society, government, family, “well-meaning” friends, advertising, religion and ourselves. It is next to impossible not to believe this “fact” to be true. As a hypnotherapist I find that a large part of my work is to help clients reprogram themselves to what they want in their lives. We help to de-hypnotize them after finding out what they want. You can achieve great things in life if that is what you want. There is a secret of life that I will share with you and you may not believe it. You are not doing anything that you do not want to do. Yes, this is true. You are not doing anything that you do not want to do. How can this be, you ask? Simply, you decide to do what you think is best at the time you make the choice. You decide based on all the information that you have at the time. After you make a choice you may get more information that you see that another decision is in order. So make it! Every choice has ramifications. Some of these ramifications are good and some of them are not so good. All of them are more information to help you make another choice. The key is not to get so married to a choice that it locks you out from making another choice. Make a choice and then make another if you need to and you will need to. Not making a choice is making a default choice. But if you want to have more control, meaning more power, in your life you need to start making more conscious choices. The more choices you make will help to empower you more and more and will help your life to run more smoothly. As you learn to work into the flow of life and begin to make more and more conscious choices you will see more “coincidences” present themselves. I used to say the a coincident was God’s way of remaining anonymous. But really what is happening is much larger than that. If there could be anything larger than God. But we can look at coincidences in the way of mathematics. For two things to come together it means that they coincide with each other. This is a coincid-ence, a perfect alignment of the universe at that moment. 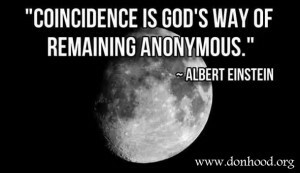 Thus, for something to be a “coincidence” it means that there is a perfect alignment with the universe and you were there to experience it. As you begin to make your own choices and begin to learn to pay attention you will see the universe unfolding as it should and understand that the coincidences in your life were not just happenstance but instead an alignment to the universe and things are unfolding as they should. And you are a part of it all! You are anyway so you might as well start participating. Allow the universe to help you as you go through life. Look for these “coincidences” and accept them as part of your path. You will see more and more of them if you will allow them to come into your life. Some people push them away, ignore them or disvalue them. Go ahead and let them come into your life, stop driving with the emergency brake on! The more we allow, the more will be presented to us.